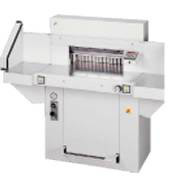 GBC South Australia has a range of high quality, German engineered guillotines ranging from manual to electric and hydraulic. This range incorperates state-of-the-art technology and safety features. 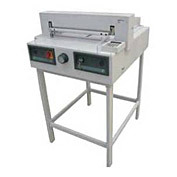 This powerful office guillotine is designed for manual operation. Electro-mechanical blade drive; manual paper clamp; spindle driven backgauge with hand crank. 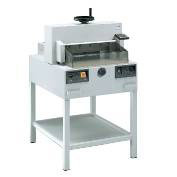 The GBC 450EP electric guillotine incorporates a 20-job memory & front and rear safety covers. 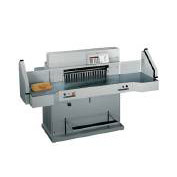 This is a is a high quality guillotine with an electric blade drive. 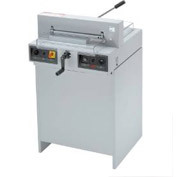 The GBC 551LT guillotine is a first class hydraulic machine. 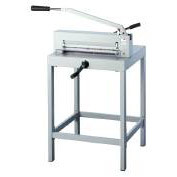 View Details -->> This is professional hydraulic power guillotine.